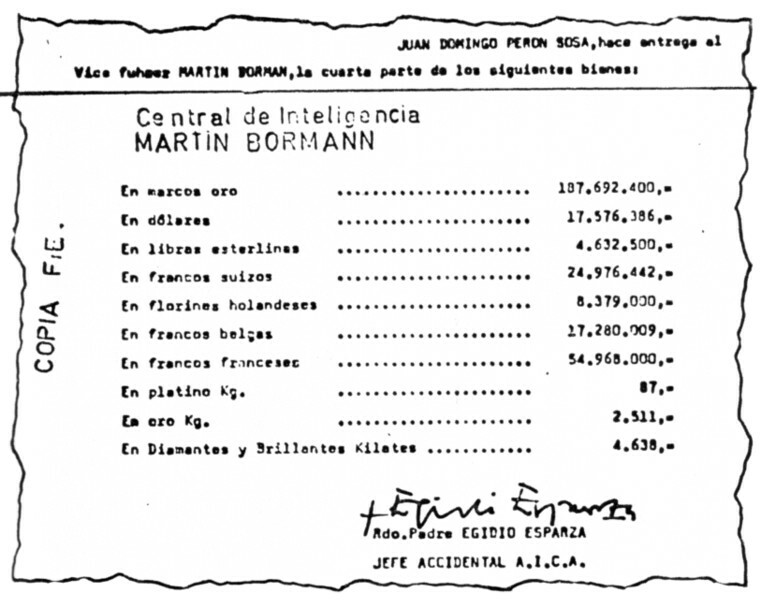 A rare financial document of a joint bank account shared by Bormann and Peron in the Deutsche Bank of Buenos Aires, from the files of Central de Inteligencia of the Argentina secret police of the Ministerio del Interior. Martin Bormann had bank accounts in many cities, among them Berlin, Zurich, Buenos Aires and New York, when he served Hitler and Germany as Reichsleiter. His present account in the Deutsche Bank of Buenos Aires dates back to 1941, when he began transferring funds through his personal account to Juan and Eva Peron. Even then he regarded Argentina as the most likely sanctuary for himself and Hitler, if Germany collapsed. But it was necessary to sweeten the growing relationship with the Perons with a flow of money that reached a total of $100.000.000 by 1955 when Juan Peron was forced into exile, first in Panama and then Madrid.